One of the benefits of being a member of the National Wooden Pallet and Container Association is being able to use Pallet Design System, or PDS. This program is a computer-aided engineering tool used to design pallets. It was developed at Virginia Tech University in conjunction with the NWPCA and the USDA Forest Service. The program and testing began in 1980 and has continued to be researched and improved upon over the past 30+ years. Why do we use PDS? Well, it’s simple. PDS takes the guesswork out of your pallet specifications. It also makes sure your pallet spec isn’t overbuilt by using an unnecessary amount of lumber. This can decrease the price of your pallet and save your company money over the long haul. Each customer’s unit load is different from boxes to bags to pails to drums. Your weight requirements could be a few hundred pounds or several thousand pounds. 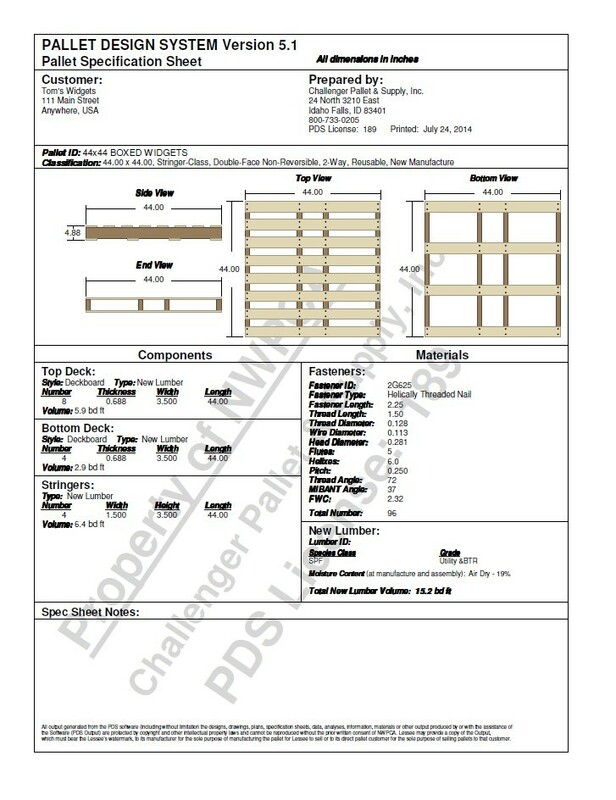 PDS draws your pallet spec and gives us a structural analysis that predicts how your pallets will perform in various situations today. PDS can impact the environment and your products. By increasing the quality of the pallet, it is possible to lower packaging costs in other areas. The better the pallet supports your products, the less packaging materials are needed for the outside of your product. Safety is a major reason why we use PDS to design pallets. PDS can analyze the performance of pallet in a rack system, being double or triple stacked in a warehouse, being lifted by a forklift, and many other scenarios. The engineering program has a safety factor built in that assures your pallet can safely hold a calculated weight. PDS is a proven program required by many of America's largest corporations when they are choosing a pallet and a pallet supplier. Are you or your customers storing your pallets on pallet racks? Do they stack them 2-3 pallets high in their warehouses? Are the boxes or bags supported properly by top deck boards of the pallets to prevent crushing of your valuable products? Can your new pallet design be accessible by a pallet jack? All of these questions can be answered with a PDS analysis performed by your trained customer sales rep at Challenger Pallet. Give us a call today and we can discuss more of the benefits of a PDS analysis for your pallets.